A kitchen grease fire can occur easily, and they are one of the most common causes of both kitchen fires and house fires in general. These types of fires occur when oil or grease that you're cooking with on the stove (or even in the oven or grill) becomes too hot. First the oil will begin to smoke, and will then quickly catch fire. And unfortunately when this happens most people don't know how to properly put these grease fires out, and you've only got a short window of opportunity to deal with it yourself before it spreads so much that it would be unsafe for you to even attempt it. But after you read this article you will know exactly what to do, and what not to do to keep your family and home safer and extinguish these very hot, quick spreading fires. You should formulate your plan now for what you would do in case of a grease fire, and go over it frequently with everyone who cooks in your home because seconds count. Then, if it actually occurs instead of standing there panicking, and using up the short window of time you've got to try to put it out before it spreads too much, your brain can just go on autopilot and do what needs to be done safely and effectively. Do not use a wet towel. This will also cause the fire to flare up and could pull the pan onto the floor, potentially burning the person who threw the towel and also spreading the fire to the floor. Do not use a water based fire extinguisher. This will cause the same bad consequences as using water. Do not try to move the burning pot or pan outside. 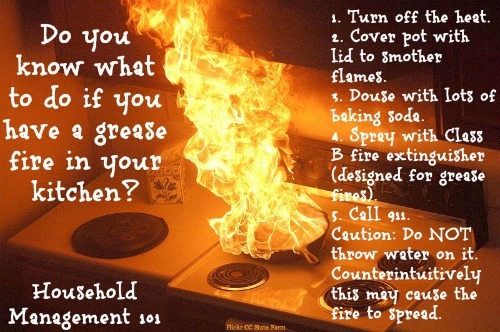 Burning sloshing grease will most likely get onto you and spread throughout your house as you try to carry it. This is dangerous for so many reasons, so just don't do it! 1. Turn off the heat source. The grease or oil ignited in the first place because it got too hot. So turning off the heat source is a good first step, if you can do it safely. Remember though that oil and grease cool slowly, so just turning off the heat will not in itself be enough, especially once a fire has already started. 2. Smother the flames with a pot lid, if you can. We all learned in elementary school that fires need oxygen. 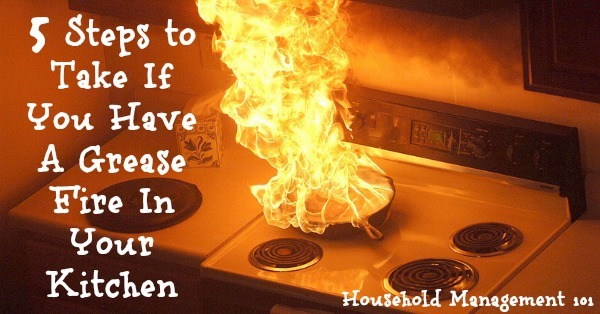 You can smother a grease fire if it is still very small by putting a lid on the pan. This only works if the grease or oil just caught fire a few seconds before, because otherwise it is too dangerous for you to try to stick your hand near the burning pan to try to put a lid on it. You must let the hot oil, which we all know cools VERY slowly, to have time to lower significantly below the burning point before taking the lid back off. Further, do not use a glass lid to try to smother the flames because they can break due to the heat and pressure from the fire. You can use a cookie sheet in lieu of a lid if you dont have a lid nearby, although it may not be as good of a fit and some oxygen may still be getting to the fire with this method. 3. Douse the grease fire with lots of baking soda. Have baking soda nearby at all times when cooking as it can successfully put out a grease fire. Baking soda works by smothering the flames of a small grease fire. If it is a large fire don't even bother trying this method though because even for a small fire it takes a LOT of baking soda to put out the flames. However, if you have enough to coat the pot, then this can be an effective method. It is the specific chemical composition of baking soda that makes it effective for extinguishing this type of fire. Other white powders common in your kitchen will NOT work in the same manner. Therefore, do not use sugar. It can melt down and cause the fire to get worse. Anyone that has made candy knows sugar can burn. Further, do not use flour. It is also combustible. Finally, baking powder and baking soda are not the same thing. This tip works for baking soda, not for baking powder. Another common ingredient in your kitchen that may help put out grease fires, however, is salt. Salt has a very high melting point, and so some people suggest using it for smothering these fires in a similar was as you would baking soda. Again, it would take a very large amount of salt and some don't think salt is as effective as baking soda so I'd personally rather use baking soda. You can also use a Class B fire extinguisher, which is the step directly below. 4. Spray with a Class B fire extinguisher (designed for grease fires). There are different types of fire extinguishers, which are designed to put out different kinds of fires. As discussed above water based fire extinguishers are not effective for grease fires, and actually make them worse. However, Class B fire extinguishers, also commonly referred to as kitchen fire extinguishers, are very effective for putting out this type of fire. You need to have a Class B fire extinguisher in your kitchen at all times (or a combination extinguisher that is effective for Class A, B and C fires.) Make sure everyone knows where it is, and can get to it quickly and easily. Call 911 before the fire gets too bad. A homeowner only has 30 seconds to 1 minute to put out the fire before it is beyond their abilities, according to the CBS Early Show segment on fire safety (see below for the video). Even if you think you have put out the fire the fire department still suggests that you contact them, because fires have been known to reignite. Better safe than sorry with your loved ones and possessions! Here's an excellent video that shows many of the tips I've discussed in action, and also shows how quickly these fires spread, and what happens when you use water to try to combat them. The video is just a bit over five minutes long, but definitly is worth the time in viewing it.